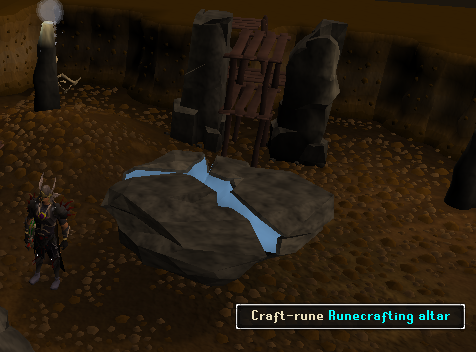 Ourania Cave contains the most unique Runecrafting altar in the game. At this altar it is possible to create any non combination rune without the need of any talisman or tiara. The runes you craft are completely random and unpredictable but, the very nature of this altar allows you to craft runes that you do not have the minimum Runecrafting level to create otherwise. There is also a bank in this cave which has a fee of 20 runes per use. If you use this cave to Runecraft you will get fast experience but not make as much cash as you would if you made runes the traditional way (e.g. Natures through the Abyss). To use this spell, you need level 71 magic and must have also completed Lunar Diplomacy. Also, before this spell can be used you must visit Baba Yaga in her chicken house in the northern part of Lunar Isle with the Lunar Spellbook equipped. When you are there, she will tell you a brief story and you'll gain access to the spell. The spell requires 2 Astral Runes, 1 Law Rune and 6 Earth Runes to cast. This spell will teleport you to where all of the colored lines meet on the above map. If you have completed the Tree Gnome Village quest then you can use the Spirit Tree network to teleport to the Khazard Battlefield. From there head west following the yellow line on the above map. If you have completed Fairy Tale Part 2: Cure a Queen then you may use the Fairy Ring network to teleport to the south of Tree Gnome Village using the code CIQ. You will need a Dramen Staff or a Lunar Staff to do this unless you have completed Fairy Tale Part 3. From where you appear head north until you cross a bridge and then north west until you reach the entrance. The line on the map representing this path is red. If you have completed Plague City and have at least level 51 magic you can teleport to Ardougne with 2 Law runes and 2 Water runes. From here, walk West until you cross a bridge. From here head south west until you see the Spirit Tree. Now just head West until you're there. The light blue line represents this route. With a Ring of Duelling, teleport to the Castle Wars lobby. Head outside and then north until you cross two bridges. Now head north east until you have passed the Observatory Village. Now just head north until you're there. The green line represents this route. For a cost of up to 3,200 coins you can charter a ship to take you to Port Khazard from any other charter ship in Runescape. From Port Khazard you should head north west until you're there. The orange line represents this path. Just walk to one of the above locations and follow the instructions from there. The entrance is right next to the Chaos Altar. If you ever need to recharge your prayer you can always come here and pray. Once you have descended the ladder you will be inside a large cavern. Inside you will see Eniola wandering around with his large backpack. 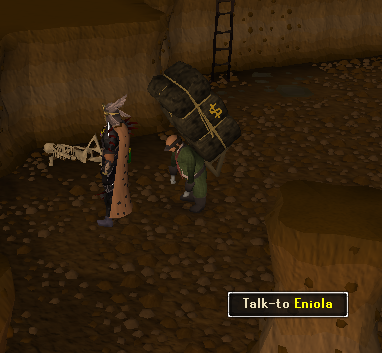 Eniola is a representative from the Bank of RuneScape who was especially hired by the Zamorak Magical Institute to stand here and provide banking services to the Zamorak crafters. You will see the Crafters walking from the Altar to Eniola and then back again. He has been instructed to provide his services to you for a cost of 20 runes for every time you wish to access your bank account. Please note that this rune cost cannot be paid for using an elemental staff or combination runes. All 20 runes must be of a single type. The cheapest way to do this is to carry a stack of several hundred body runes at all times within the cave. If you need more body runes you can easily buy them in large quantities for 16 coins each from rune shops such as Aubury in Varrock or Betty in Port Sarim. Another method to get masses of cheap runes is to buy bodies, minds and basic elemental runes off of other players for 10 to 15 coins each. There are two paths to the altar from the entrance. Each has its own advantages and disadvantages. Taking the path that goes directly south is the shortest of the two and therefore, will allow you to craft runes faster. The disadvantage of using it is it is inhabited by aggressive monsters ranging from level 38 to 98. Between them all three attack styles are used. The monsters that use melee are Cave Lizards and Zamorak Warriors. There are also Zamorak Rangers who use ranged combat and Zamorak Mages who use offensive magic. 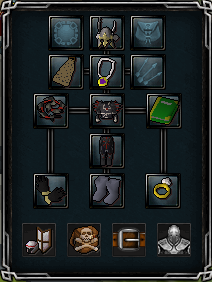 You don't have to worry about the Zamorak Crafters as they are not aggressive but do use melee when attacked. This cave is a multi combat area so the enemies will pile you. It is recommended to find a busy world where these enemies will have multiple targets for their attacks. The current unofficial world for using the Ourania Altar is world 84. Cape: Spottier Cape, Spotted Cape, Fire Cape, Obsidian Cape, Skill Cape, Legends' Cape or Team Cape. If you wish to use prayer it is recommended to use protect from mage as the mages hit the most when you have the recommended equipment. 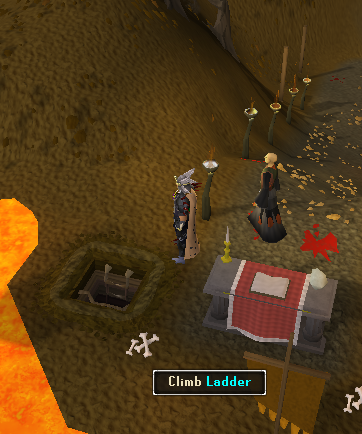 If you need to recharge your prayer there is a Chaos Altar right next to the entrance of the cave when you exit. This path is the one that runs to the south east over the lava. It loops back and forth and is about two times as long as the safe route. The advantage of it is that there is no enemies here at all making it the path of choice for lower leveled characters. At the end of the path there is a crack in the wall that you will need to squeeze through to get to and from the altar. There is no agility level requirement to squeeze through the crack. It is possible to create any rune here without a talisman or tiara. You will craft runes before you have the required Runecrafting level to make them the normal way. This altar gives twice the normal amount of experience for every rune that you craft. It is the closest Altar to a bank. The chance for a certain rune to be crafted is completely dependent on the crafter's level. For example, A level 35 Runecrafter will get mostly Cosmic, Chaos and Astral runes but, will also get a few elemental runes, minds, bodies as well as the occasional nature, death, blood and soul rune. In other words, a very low level Runecrafter will very rarely get a blood whereas a very high level Runecrafter will get several bloods and the occasional elemental rune. You always get only one rune per essence regardless of Runecrafting level. 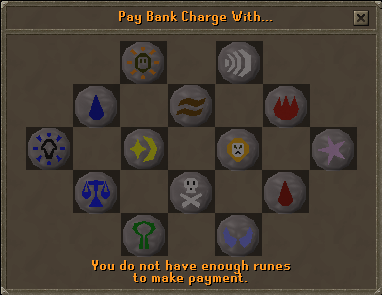 The bank requires you to donate 20 runes every time you wish to access your account. There are several aggressive enemies along the short path to the altar. You must use pure essence. As mentioned earlier, there are five different monsters inhabiting this dungeon. They are considered to be good training as they have low attack and strength levels so they won't hit often and won't hit for more than 90 damage. They have high Defence so they will take a little longer to kill than other monsters of their level but do have good drops for their level. The monsters are listed below along with their combat style and their drops. Main Drops: Bones, Fire Runes (2), Water Runes (5), Death Runes (3), Body Runes (3), Chaos Runes (4), Blood Runes (4), Air Runes (5), Nature Runes (2), Soul Runes (3), Law Runes (3), Coins (50) and Pure Essence (3). Main Drops: Bones, Coins (100), Steel Dagger, Rune Dagger, Lobsters (3), Adamant Longsword, Steel Scimitar and Rune Scimitar. The easiest is to run back and forth from the altar to the bank. When using this method it is advised to always have one stack of cheap runes so you won't be locked out of your bank account. Bodies are recommended because they are cheap and readily available. The next method is to run to the altar and then use Ourania teleport to get back to the entrance. This method is faster then the walking method but uses more runes. You will also require a stack of runes at all times so you can pay the banker.